I used fat quarters of the new Confetti Blossoms from QT Fabrics. They are so bright and beautiful - I love how my quilt turned out! 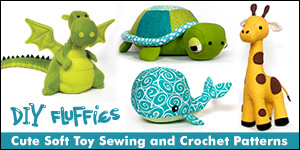 Ask for this collection at your local quilt shop or find them online at Bear Creek Quilting Company. 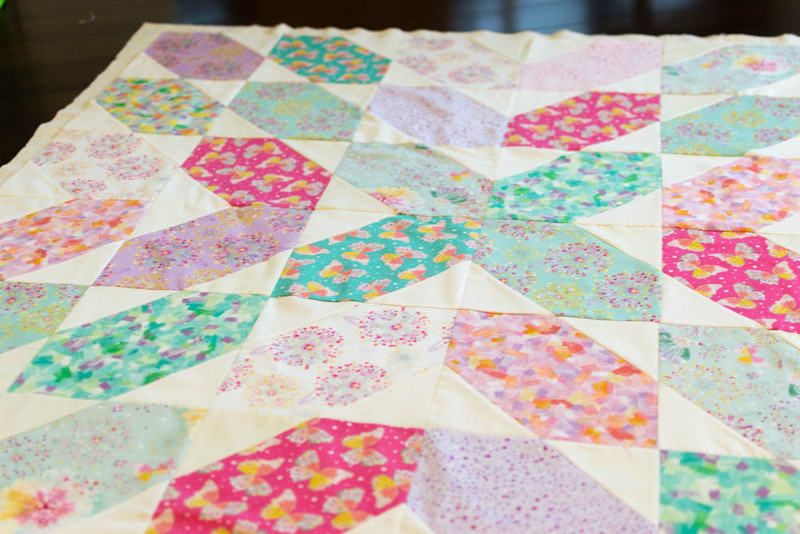 The Fat Quarter Fancy throw quilt is approximately 52'' square - made up of 36 blocks that are 8 1/2'' (finished). That's a smallish throw quilt or a large baby quilt. You could easily adapt the pattern to make it larger or smaller using more or fewer blocks. I used my leftover fabric to make a scrappy binding. You will need an extra fat quarter if you want to use them for the binding too. 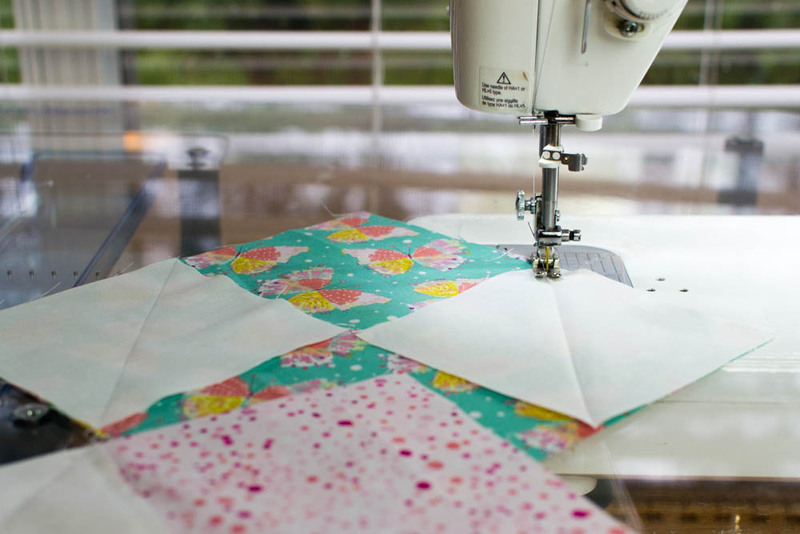 Are you ready to make a Fat Quarter Fancy Quilt? Let's go! Fat quarter diagram (if you are cutting a strip for scrappy binding). 1. Mark a diagonal line through the center of each 4 3/4'' square. You may use the fabric marking pen. I find it easier to mark the squares by folding them in half diagonally and pressing the fold lightly with an iron (see the photo above the cutting instructions). 2. Place a 4 3/4'' background fabric square in the corner of a 9'' square as seen above. Sew along the marked line. 3. Continue sewing a 4 3/4'' squares to each 9'' square - it's faster to chain piece them without cutting the thread as seen above. 4. Then turn the long string of squares around and sew a 4 3/4'' square to the opposite corner as seen above. I still haven't cut the threads in between each block yet. Now it's time to cut the threads in between each block. I found this Sunflower Quilts Thread Cutter at quilt market. It's a fun way to separate chain pieced quilt blocks. 6. Fold the background corners back and press. Repeat steps 5 and 6 to make 36 blocks. 7. Arrange the blocks as seen in the diagram above. Note that the quilt top can be divided into quarters and the blocks in each quarter are all 'pointed' in the same direction. 8. Sandwich the quilt top and backing with the batting in between. I used SpraynBond basting spray to hold them together. Quilt as desired. I quilted straight lines about 1/2'' apart using my walking foot. Trim the extra backing and batting away. 9. Sew the binding strips together at an angle to make at least 220'' of binding. If you are making scrappy binding, you'll need more than just the strips cut from the 9 fat quarters (those will only make about 160'' of binding). 10. 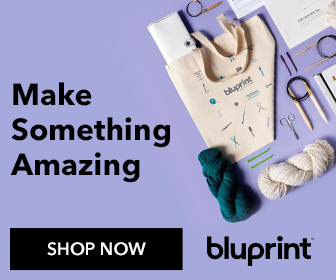 Bind and fall in love with your new quilt! I used the same machine binding method that I use on my mini quilts. I'm adding this pattern to my list of 11 Modern Quilt Patterns... all easy and free!